For the past couple weeks I've been busying myself with some graphic and exhibit design, in collaboration with some fellow Berkeley students from Colombia and Professor Nicholas de Monchaux. 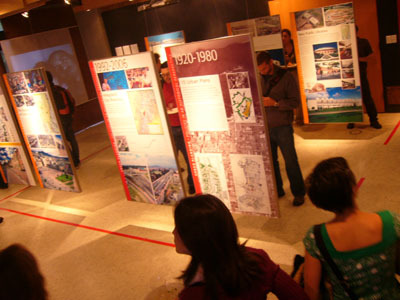 Friday marked the opening of the exhibit and a great lecture by former mayor Enrique Penalosa. Yesterday was a day-long symposium discussing some case study projects (Millenium Park and the Transmilenio bus system). 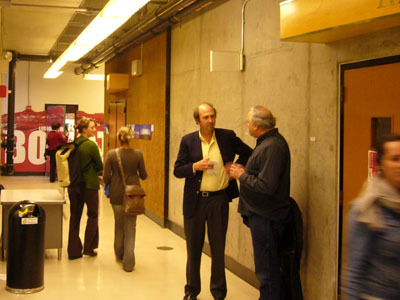 Architect Daniel Bermudez also lectured Friday giving his vision of architecture deeply embedded in an urban context. 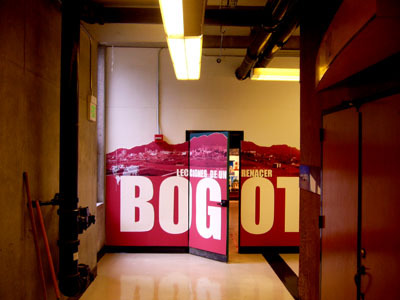 The occasion of all this display and discussion about Bogotá stems from the city's transformation which is widely heralded as unique and departing from the spectacle, private-market driven model exemplified by the revitalization of Barcelona 15 years ago. The city has bounced back from a traffic-drug-crime-ridden hell-hole to a place with pedestrian boulevards, bike paths, a great bus system, and overall a civic environment which encourages participation and self-regulation. 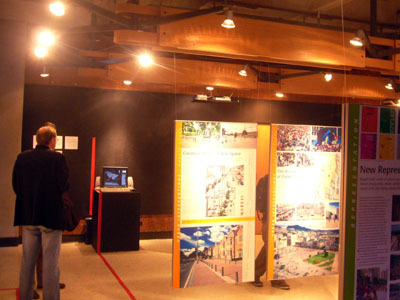 The city won the Golden Lion Award at the 2006 Venice Biennale. 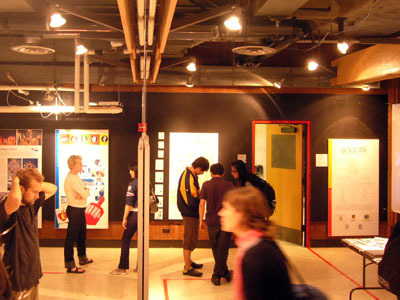 The exhibit consists of some panels from an exhibition at Georgetown University which are English versions of the panels from the Biennale. 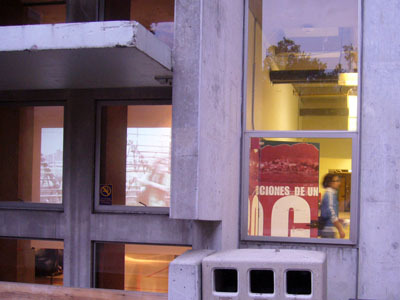 One of the Colombian students here got the artist group mapa teatro to contribute some of their video work which we are projecting on vellum screens in front of the exhibit room's windows, effectively projecting Bogotá into the Berkeley campus and community at-large. 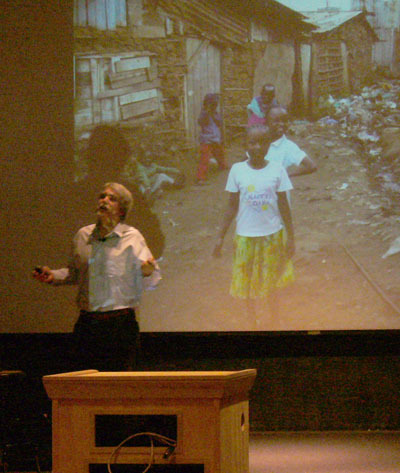 So that was opening night, and the lecture by Enrique Penalosa which followed was, at about two hours long, a pretty intense experience. The guy is very, very persuasive. BUT, he is a politician, no? You can't help but grow a little weary of the voice which wants you to see things his way, the wonderful gestures and expressive face that gives personality to the forces that shaped the city during his three years as mayor. One amazing thing to see, though, was how he tied the goals of his administration to those that any global city where there is a huge difference between rich and poor. (hence the image of him in front of a slum in an African city). Overall, it was an inspirational lecture. 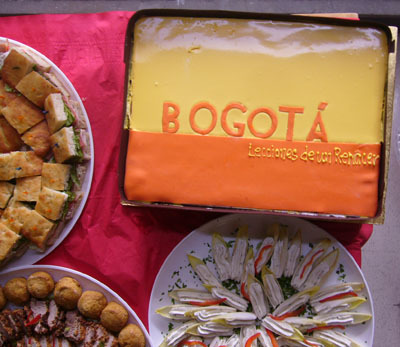 You can see how the lessons learned in Bogotá will go far beyond the city limits. My feeling toward him shifted a bit during the symposium, which I only attended intermittently, but I found him totally dominating the floor and it seemed pretty impossible to say "Okay Mr. Penalosa, we get your point, can we please move on?" I must emphasize this was my view of the symposium and by no means do I represent the views of my school. It was quite an honor to have him with us. Thanks for your very interesting comments. I went to Architecture School in Bogota and now work in the US, and I just came back from Bogota after 10 years of absence. It is really amazing the tranformation of the urban environment more sensible to the working masses. The new examples of architecture are worth the trip down there to understand the great solutions improving the developing city with so many people living in proverty.